Posted in Lama Zopa Rinpoche News, Lama Zopa Rinpoche News and Advice. 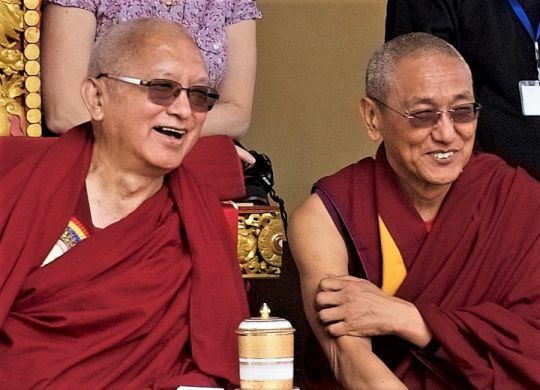 Lama Zopa Rinpoche and Kopan abbot Khen Rinpoche Geshe Chonyi share a smile while watching the performances after the enthronement of Thubten Rigsel Rinpoche. Photo by Bill Kane. 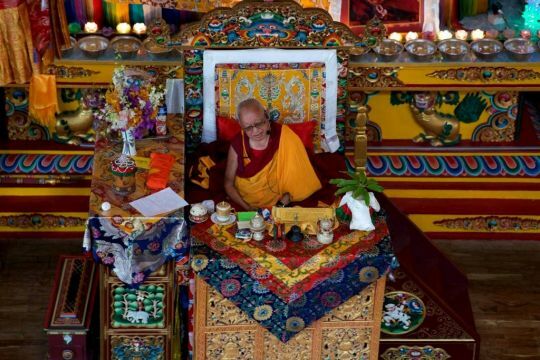 Lama Zopa Rinpoche has been staying at Kopan Monastery since late February. Rinpoche first celebrated Tibetan New Year (Losar) at Kopan. Palden Lhamo puja early morning on Tibetan New Year (Losar), presided over by Lama Zopa Rinpoche, Kopan Monastery, Nepal, February 2017. Photo by Ven. Lobsang Sherab. He also circumambulated and made offerings at stupas in Boudhanath and Swayambu. 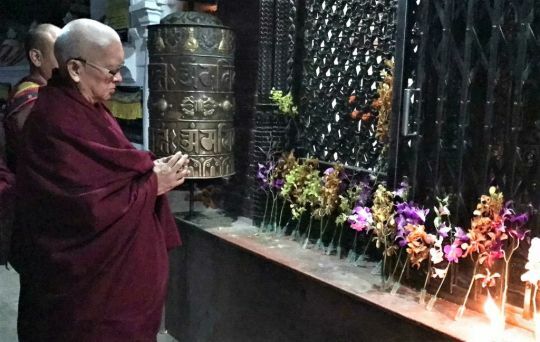 Lama Zopa Rinpoche making late night flower offerings at Boudhanath Stupa, Nepal, March 2017. Photo by Bill Kane. 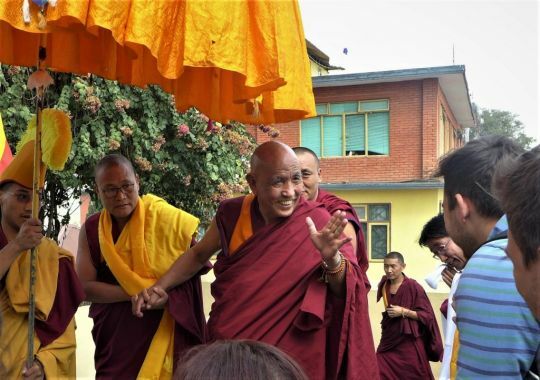 As well, he presided over the enthronement of Thubten Rigsel Rinpoche (the reincarnation of Khensur Rinpoche Lama Lhundrup, Kopan’s former abbot), a celebration that attracted almost a thousand visitors to Kopan, and he visited the Himalayan Buddhist Meditation Centre in Kathmandu. Thubten Rigsel Rinpoche at his enthronement, Kopan Monastery, March 6, 2017. Photo by Bill Kane. Rinpoche also met with His Eminence Jangtse Chöje Lobsang Tenzin Rinpoche, who came to Kopan to attend the Great Prayer Festival (Monlam Chenmo) and teach on mind training on March 14. Jangstse Chöje Rinpoche received a warm welcome when he arrived, with gyalings, cymbals, and banners, and lines of students offering khatas. His Eminence Jangtse Chöje Rinpoche arriving at Kopan Monastery, March 2017. Photo by Laura Miller. Lama Zopa Rinpoche also met with Yangsi Rinpoche, IMI Sangha, and other lamas and dignitaries. Yangsi Rinpoche participating in the enthronement of Thubten Rigsel Rinpoche, Kopan Monastery, Nepal, March 2017. Photo by Bill Kane. 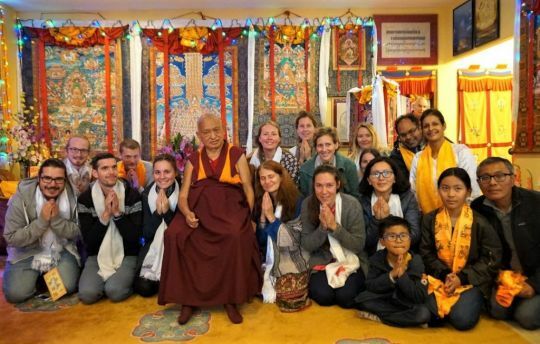 While at Kopan, Rinpoche also visited with students doing a three-month Vajrasattva retreat at the monastery, and gave them encouragement and advice. Lama Zopa Rinpoche with the Vajrasattva retreatants during their three-month retreat at Kopan Monastery, Nepal, March 2017. Photo by Ven. Lobsang Sherab. 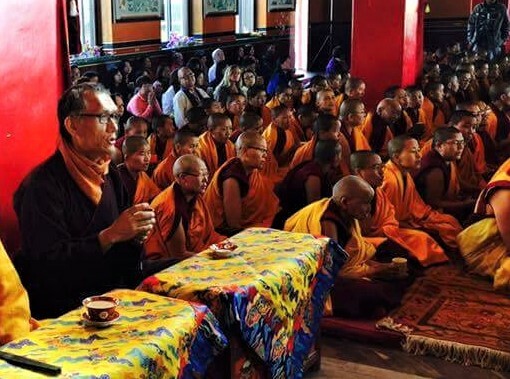 On March 7, Lama Zopa Rinpoche gave an Amitayus long life initiation attended by Tenzin Phuntsok Rinpoche and his younger brother, the newly enthroned Thubten Rigsel Rinpoche, among many others. Lama Zopa Rinpoche giving a long life empowerment, Kopan Monastery, Nepal, March 7, 2017. Photo by Bill Kane. Rinpoche later attended a Lama Chöpa with tsog, where he was joined by Jangtse Chöje Rinpoche. 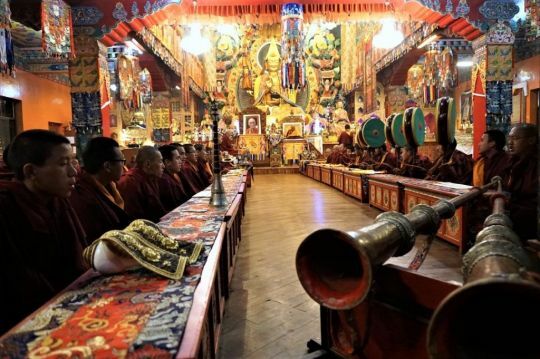 The gompa was full for this precious opportunity for both monastic and lay students to celebrate Lama Chöpa with their revered lamas; robes and funds were offered to Sangha, and the tsog overflowed. After the puja, Lama Zopa Rinpoche gave a talk about the importance of circumambulation, stressing the need for setting a beneficial motivation and describing how to visualize offering rice to a stupa. Lama Zopa Rinpoche speaking to attendees at the dinner at the Hyatt. Nepal, March 2017. Photo by Bill Kane. After the meal, Lama Zopa Rinpoche gave advice again on circumambulation, and close to 200 people followed him over to Boudhanath Stupa. 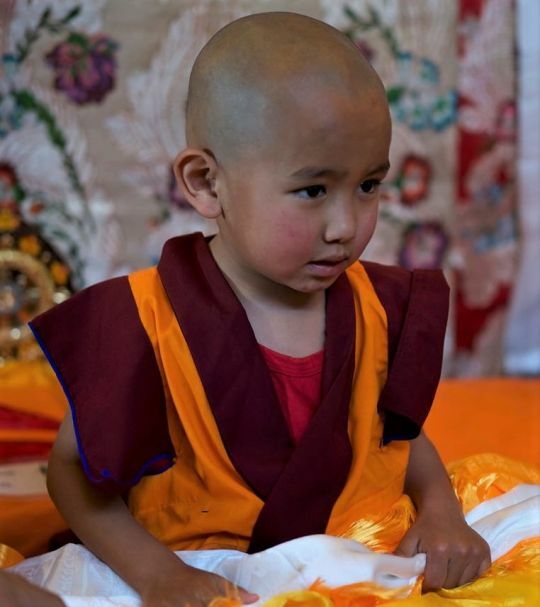 There, Rinpoche led them in seven circumambulations around the stupa, stopping occasionally to give reminders about motivation, offer advice, and, at the end, lead a dedication. The circumambulation ended around midnight, and—tired but joyful—those present said goodnight to each other and to Rinpoche. 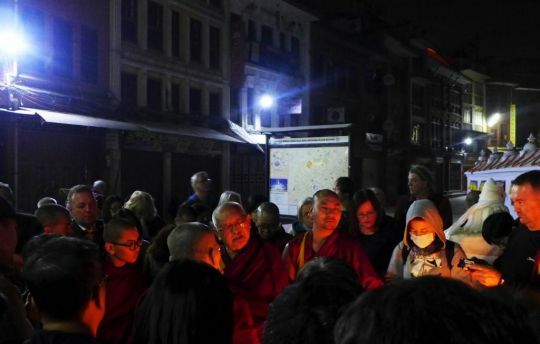 Lama Zopa Rinpoche leading dedications late at night after circumambulating Boudhanath Stupa with a group of students, Nepal, March 8, 2017. Photo by Laura Miller. 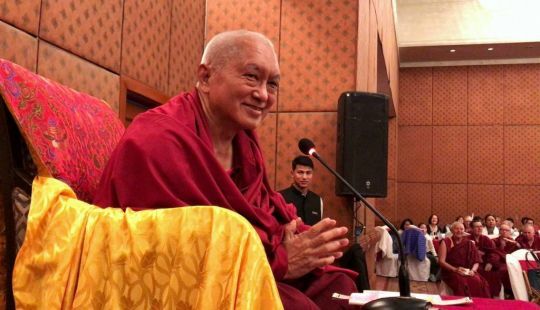 Lama Zopa Rinpoche is the spiritual director of the Foundation for the Preservation of Mahayana Tradition (FPMT), a Tibetan Buddhist organization dedicated to the transmission of the Mahayana Buddhist tradition and values worldwide through teaching, meditation, and community service.